Knowledge : Omeshi - KIDORAKU Japan - What a Kimonoful World! Omeshi is a kind of Chirimen (silk crepe) kimono. It belong to the Tsumugi (woven kimono). But it's distinguished from another Tsumugi or Chirimen kimono. Usually, Chirimen is dyed after weaving. However, Omeshi is weaved after dyeing. Recently, it is not produced so much. You only can find it as an antique kimono. "Omeshi" means a noble parson puts on clothes. Ienari, the 11th Tokugawa Shogun loved this textile, and it's called "Omeshi". So, Omeshi is the highest class kimono in woven kimono. 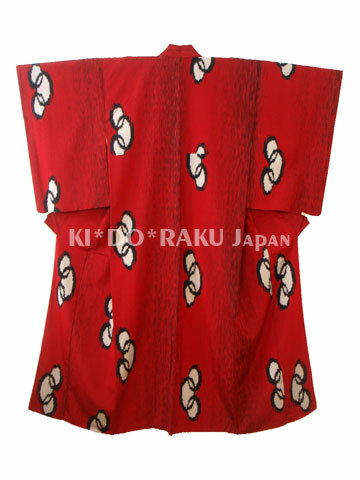 Generally, woven kimono is considered to casual. Basically, Omeshi is casual wear. you might be able to use Omeshi as semi-formal.